Call it the herbal aspirin effect, or what you may, natural herbs provide us a veritable, holistic medicinal tool-kit for optimal health and well-being. They also offer us the natural ‘ammo’ to combat pain and other illnesses, without the adverse side-or after-effects of traditional, non-steroidal anti-inflammatory drugs [NSAIDs]. Nature’s Aspirin explores what herbs in the form of simple, yet profound ‘Kitchen’ remedies, such as green tea, turmeric, ginger, holy basil, rosemary, skullcap , oregano etc., hold for us-a mirror to the future of pain relief , including the prevention and treatment of a host of illnesses……the only ‘side-effect’ being good health and optimal wellness. Rajgopal Nidamboor is one of those rare individuals who embodies all the qualities necessary to be an exceptional writer, journalist, editor and publisher. His commitment and dedication is unsurpassed. I have known him for more than a decade-and-a-half and during this time he has exceeded all of my expectations. In my years as practicing physician, author and editor, I have never met anyone more capable or more dedicated, especially in the field of mind-body/integrative medicine. Modern medicine and surgery offer impressive capabilities to treat pain, infection, allergy, and inflammation. Yet, notwithstanding the 'miracles' achieved through pharmaceutical innovations and surgery, drug adverse effects and surgical failures continue to occur and not infrequently too. In fact, iatrogenic disease, the medical term for disease caused by medical treatment, is now the third largest cause of death in the US alone — it is only surpassed, or exceeded, by cardiovascular disease and cancer. This makes it clear that there is a need to be able to support chronic medical conditions without necessarily resorting to drug therapy. It is ironic that medicine has belittled herbal medicine, naturopathy, and integrative medicine. The point is: natural-based treatments offer holistic support for pain syndromes and other diseases without the risk of adverse effects and medical complications. In other words, natural approaches employed by herbal, naturopathic and integrative practitioners provide significant symptomatic support without the risk of side-effects, typically experienced with drugs. Nidamboor introduce the reader to aspirin-like natural herbs and their therapeutic approaches needed to treat pain and other health problems without the need for medication, or less medication. They make the case simple and clear: that although there is a wide range of medical and surgical treatments, most are unnecessary... if the patient were to implement dietary, lifestyle and exercise modifications as well as use specific herbal supplementation. This is not all. They also explain how the use of herbs may be able to prevent certain health issues from developing in the first place. 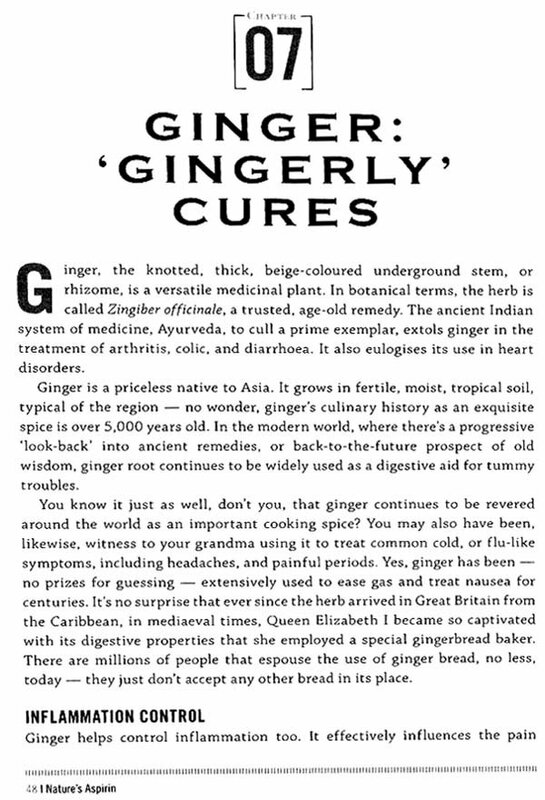 Medicine has, for long, ignored the research that supports the use of natural herbs and herbal supplementation. Raj and Jawahar discuss journal and other studies that demonstrate their effective use. While medical literature now acknowledges that, in contrast to drug therapy, herbal and nutritional supplementation pose no risk of side-effects, or iatrogenic disease, the biggest problem for most patients, regrettably, is the fear that using a natural treatment programme without the permission of their family doctor would be a waste of time and money as well as risky, or dangerous. Or, they may have a certain apprehension that alternative medicine has not been 'scientifically so well proven,' although there is increasing research demonstrating its benefits. 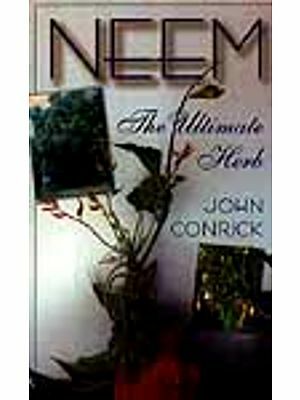 Understandably, the use of aspirin-like herbs as treatment is not like drugs; they do not produce instantaneous results, all right; besides, most have to be implemented for a number of weeks or months before changes are noted. However, the idea that such natural remedies are dangerous and ineffective is largely the self-serving estimation of the medical establishment and the drug industry. Hence, keeping out patients from trying natural remedies and making dietary and lifestyle changes is an ironic effort by the conventional medical practitioner to control them at the expense of permitting safe, effective, and inexpensive natural remedies. Well, the silver-lining is — the growing interest in herbs and natural medicine is changing and transforming the public's respect and use of such natural programmes. It is in this context that Raj's [and, Jawahar's] writing, yet again, introduces the reader to effective, cost-saving, risk-free therapeutic approaches that may be used in addition to, or in place of, prescribed drug treatments. This prompted researchers to think of alternatives — natural medicines that had all the good qualities of NSAIDs in the treatment of pain, but without their dangerous side-effects. Nature to be commanded," As Francis Bacon rightly said, "must be obeyed." The wise aphorism reflects a vision — of why and how our ancients derived healing benefits by using natural extracts from nature's wondrous bounty — especially, herbs. To the hidden roots they nourish. First thing first — let's look at the basics. Pain is part and parcel of most health affections — from joint disorders to cancer. 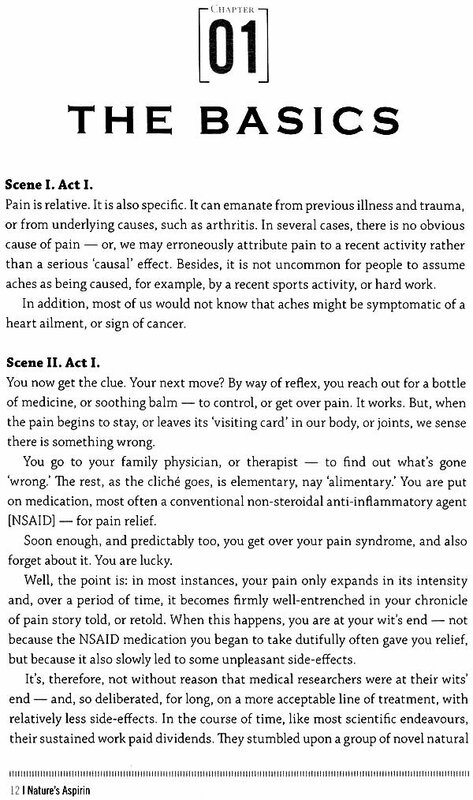 This explains why scores of medical researchers were hooked on to trying and unraveling the deep puzzle behind the pain mechanism and also to finding a better way to relieving it with medicines that went far beyond 'killing' pain alone. When a landmark research outcome emerged, and identified prostaglandins, the body's chemical messengers, as the cause of inflammation, or pain, and that they could be blocked, it led us to a new frontier. The result: a novel pain-and-inflammation-relieving medicinal assembly line called non-steroidal anti-inflammatory drugs [NSAIDs]. NSAIDs are a large group of medications. There are several types of NSAIDs, and aspirin, as you may well know, is the most common. Other examples of NSAIDs are ibuprofen, naproxen, piroxicam, nabumetone, and so on. NSAIDs were predictably hailed as 'magic bullets' to quash pain. Slowly, though, it dawned that NSAIDS were effective, all right, but caused a host of unwanted side-effects. The emergence of cyclooxygenase-2 [COX-2] inhibitors, or coxibs, a new class of medications, provided the means to 'that' end, if not the end to a means. Besides, the arrival of coxibs that work by inhibiting an enzyme known as COX-2, which, in turn, triggers the release of prostaglandins, was a boon one thought — until clinicians warned people, especially with heart problems, to exert caution and avoid their use. COX-2 inhibitors are purportedly superior to NSAIDs, in several ways. Labelled 'Super Aspirins,' COX-2 inhibitors were found to be just as effective as the wonder drug aspirin is in relieving arthritic pain, for instance, in clinical and patients' trials and treatment; besides, they also had 'comparatively' less tummy, or gastrointestinal [GI], side-effects in comparison to conventional medications, like NSAIDs. What's more, they were thought to provide equivalent pain reducing and anti-inflammatory benefits associated with traditional NSAID use — but, without the inherent side-effects or platelet-related [blood-thinning] problems of conventional NSAID agents. In addition, some clinicians opined that they could be useful agents in the management of a host of general and specific ailments, including prevention and treatment of cancer. This brings us to the foundation of this book. Is there something better than conventional COX-2 inhibitors? Yes, there is. 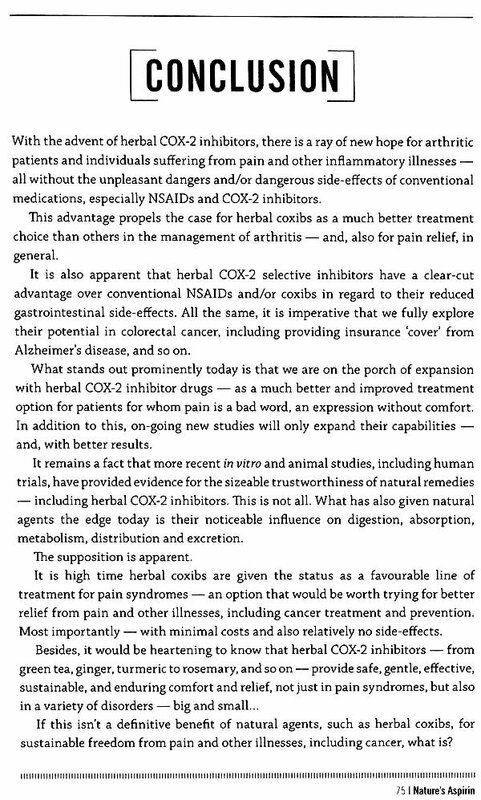 Research asserts that a natural herb, or a group of herbs, selected carefully, and in sufficient concentrations, can offer substantial relief from the fury of COX-2 inflammation and other related diseases, without the flagrant side-effects of conventional, synthetic, or prescription COX-2 inhibitors. The best part also is natural herbs come from nature — they inhibit the COX-2 enzyme, as nature ordained, and powerfully balance platelet aggregation. They 'kill' pain and inflammation naturally; they heal ulcers; they also prevent clotting and heart attacks. Call it the 'herbal aspirin' effect, or what you may — and, this natural 'ammo' comes without the solemn side-effects of conventional NSAIDs and/or COX-2 inhibitors. Besides, herbs offer us a value-added advantage — which is just not confined to merely relieving pain, or distress. They provide us a 'holistic' medical tool-kit, for not only 'inflammatory relief,' but also maintenance of optimal wellness. More so, because 'revamping' healthy particular cartilage, for one, holds the key to restoring healthy, pain-free joint function, just as much as natural pain relief, following a dental procedure, on the other. 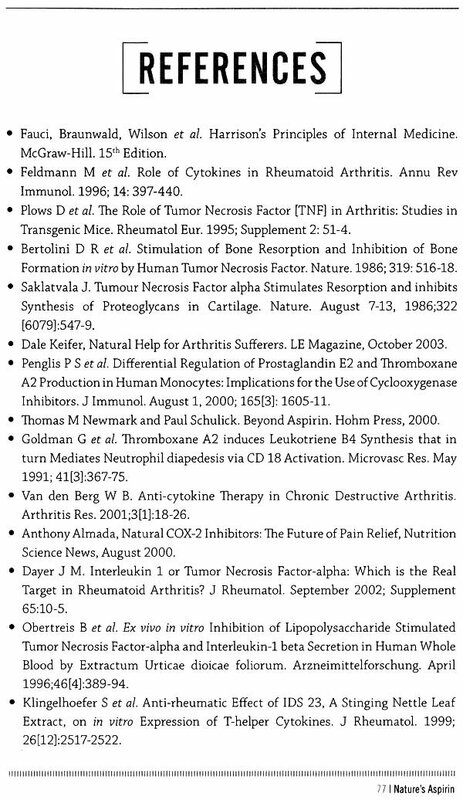 Let's now log on to the immense utility value of a handful of nature's most-favoured herbal COX-2 inhibitors in the following chapters and elicit maximum benefits that Mother Earth has bestowed and created in them... for us. All the same, before we embark on our 'nature's aspirin' journey, let us look at the basics per se — as to what makes natural, or herbal, COX-2 inhibitors a good choice in the treatment of inflammatory disorders. From arthritic pain — aside from a host of health problems — to the prevention of heart disease and cancer.